No one knew quite what to expect from Kyle Young entering this season. As a freshman, he averaged just 1.8 points and 1.6 rebounds in 8.6 minutes per game, largely playing behind Big Ten player of the year Keita Bates-Diop. But before the season, Chris Holtmann cautioned anyone to view Young as a replacement for Bates-Diop’s 19.8 points per game. He knew what Young was good at, and though he can get a bucket if necessary, scoring isn’t his top skill. Young hustles. Holtmann will never draw up a play for him on offense, but he’s always moving, always running around. Young throws his body around, dives for loose ball and rebounds. Ohio State doesn’t have the most naturally talented team. Nor does it have any semblance of frontcourt depth. So losing Young for “several weeks” after he suffered a stress fracture in his leg during the team’s loss to Maryland was far from optimal. Ohio State split its four games during his absence, winning two and losing two, and his return to the court for the Buckeyes’ 74-70 win against Penn State came right on time. Without 25 minutes from him, the result might have been different. In the final two minutes, Young made a pair of plays that altered the game. 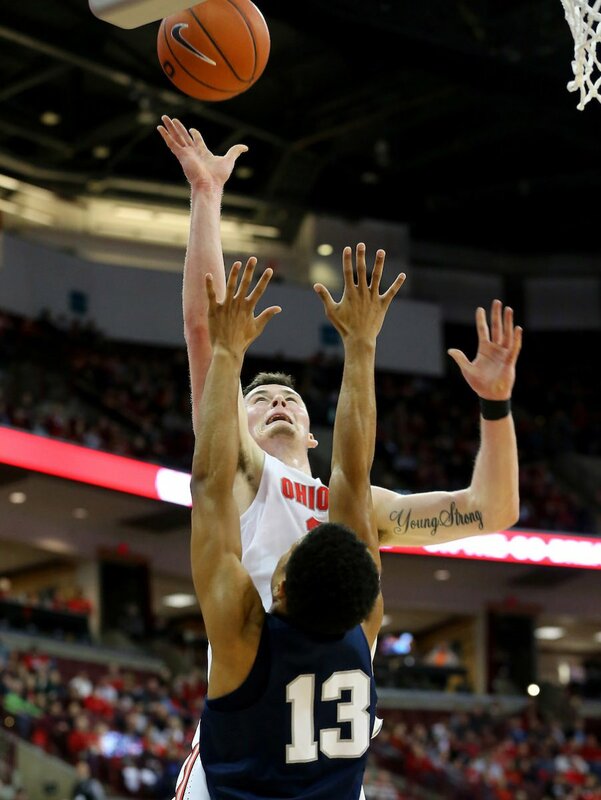 With 1:05 remaining, Young made a leaping shot in the paint over outstretched arms from a Penn State defender to give the Buckeyes a 71-70 lead, reclaiming the advantage they had just lost. Prior to that shot, he had both attempted and made just two field goals in more than 20 minutes. At the other end of the court on the following possession, Young swatted a shot to send disarray into the Nittany Lions offense, which turned the ball over, allowing Ohio State to extend its lead, eventually finalizing the victory. Young had just six points, six rebounds and two blocks, but he made plays when both he and Ohio State needed them. Penn State is the type of team for which Ohio State needs Young. Prior to the matchup, the Buckeyes heard over and over how hard the Nittany Lions play, and they didn’t want to get out-hustled on their home court. “Coach was just telling us we've got to match their intensity and come out playing harder than them, and we can't let nobody out-tough us at home,” Luther Muhammad said. Young doesn’t let that happen. He proved that at the end of the game. Had Holtmann stuck by his minutes restriction, Young wouldn’t have even been on the court in the final two minutes, when he had his biggest impact. After the game, Holtmann said he had Young on a restriction of 15 minutes, but he kept him on the court for 25 minutes. As Holtmann put it, “it's not like he's been out for six months,” so he felt comfortable playing Young for a longer stretch. Young returned to action recently, getting back on the court after Ohio State’s win against Rutgers on Saturday. So even Andre Wesson was surprised by Young’s quick return. Young also provides Ohio State more frontcourt depth when Kaleb Wesson gets into foul trouble, like he did on Thursday. Without Young, LeDee and Wesson were the only two players taller than 6-foot-6 Andre Wesson. While Young won't singlehandedly take over games, he makes winning plays and serves a key role on this year's Ohio State team, and he showed that against the Nittany Lions.